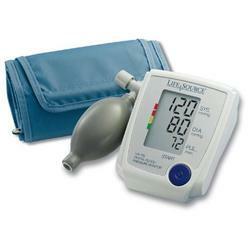 A&D Medical is pleased to introduce their newest Advanced Manual Inflate blood pressure monitor, the Lifesource UA-705. One of the unique features on this monitor is the new Pressure Rating Indicator. After a measurement is complete, this indicator will display the category the measurement falls under based on the Joint National Committee (JNC 7) blood pressure guidelines. There are four categories that the measurement can fall under: Normal (green), Prehypertensive (yellow) and Stage 1 or 2 Hypertensive (Red). The benefit of this feature is that the user will quickly know what their reading means. This durable nylon cuff is comfortable and easy to use and fits Medium arm sizes 9.4" to 14.2". The cuff has a strong Velcro hook & loop fastener that is tested for up to 30,000 uses and is backed by a lifetime warranty. This is an OEM "T" Air Connector for use with LifeSource UA-702 & UA-705 Blood Pressure Monitors.